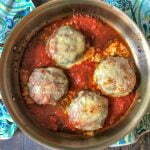 If you want an easy low carb dinner the whole family will love, try these low carb stuffed pizza burgers! Stuffed with cheese and topped with sauce and more cheese! Who wouldn't love that? Only 3.6g net carbs per burger. Make 8 thin burger patties. Heat up a large skillet and. brown the burgers on one side. Flip and then top with 1/4 cup of marinara sauce on each burger. Top with a slice of mozzarella cheese. Add extra sauce to the side of the pan if you wish. Bake for 15 minutes or until cheese is nice and bubbly. Note* I used Specially Selected Premium Marinara sauce from Aldi. It has only 5g net carbs per 1/2 cup. You can use what ever kind you like but check the label for the lowest carb count.